NFL Recap – Week 8! With just about half of the NFL season in the books, narratives have started to form around the league; be it pleasant surprises, disappointments, huge upsets, early playoff narratives, or the like. As November approaches, here are the biggest stories right now on the gridiron. The Eagles are soaring. The much-maligned Philadelphia Eagles, perennially depicted as underperformers both in the league and postseason, appear to finally matched the lofty expectations assigned to them every season. Standing at 7-1, they have the best record in the league (with their only loss a one-score loss to the AFC (American Football Conference West-leading Kansas City Chiefs), and their +76 point differential is also the best in the league. While their defense is about average (16th out of 32, exactly half-best), their offense, led by young quarterback Carson Wentz, has been thriving, scoring 20 points more than the next highest-scoring team. Wentz leads the league with 17 passing touchdowns, and with potent receivers Torrey Smith, Zach Ertz and Alshon Jeffery, he won’t be stopping anytime soon. Buffalo’s looking hot – and it’s not chicken. The Buffalo Bills have been a pleasant surprise in the AFC East, and even the league in general. The New England Patriots have probably been the favorite to become division champions since your grandparents were born, but the Bills look to be giving them a run for their money. Undefeated at home with a 4-0 record, the Bills have shunned the high-scoring, frenetic strategies of other teams in favor of a knock-down, drag-it-out physical game. They only scored 153 points, but in doing so gave up an even stingier 115 points– good for second best in the league. With only a 1-2 road record, though, to have a solid chance at playoff success the Bills will be looking to improve their play away from Buffalo. A Giant disappointment. Heading into the 2017 season, the New York Giants were given incredibly high expectations. Coming off a 10-6 playoff season, and boasting a receiving corps of Brandon Marshall, Odell Beckham Jr., Sterling Shepard, and Dwayne Harris, the Giants were put in the top-10 of countless football rankings. But describing their season as a trainwreck would be an understatement. 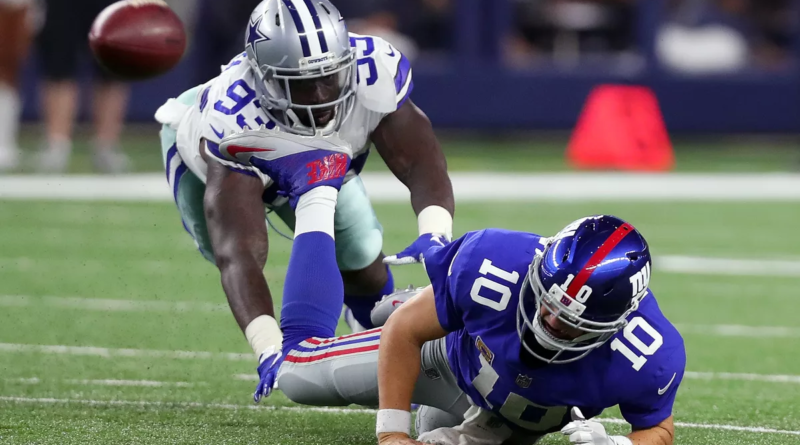 Riddled by injuries to Marshall, Beckham, and Shepard, Big Blue (as they’re nicknamed) has accumulated a 1-6 record, already matching their loss total from the year before, and even losing to the (at the time) 0-4 San Diego Chargers. 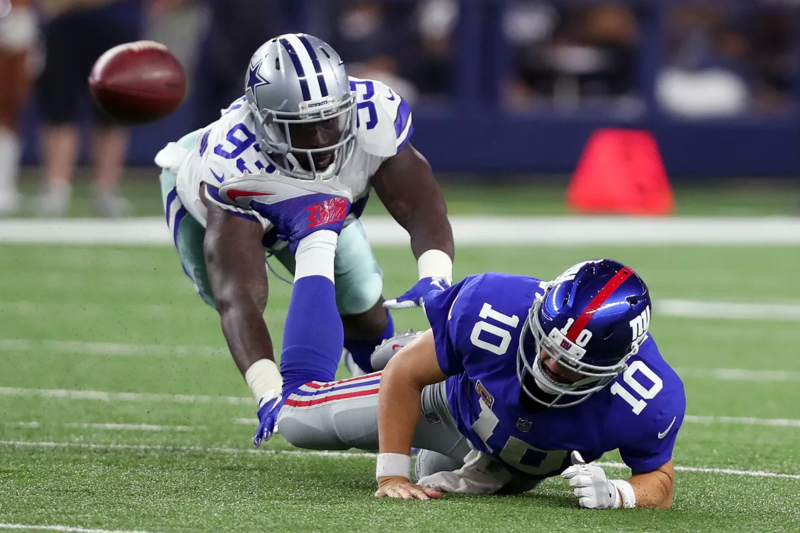 With such an expensive roster and falling so short of their expectations, the Giants are left shaking their heads and wondering what to do next: try again for next season, or blow it up and start from scratch? One fact hangs over their heads as they contemplate their decision, though– franchise quarterback Eli Manning, leading the Giants twice to Super Bowl glory in the last ten years, is already 36, and he’s not getting any younger. Race to the Bottom. The Cleveland Browns and the San Francisco 49ers can’t seem to catch a break in their rebuild. Currently both sitting (un)pretty at 0-8, they’ve been mired in mediocrity for years. Despite constantly having relatively draft picks, the Browns only seem to have gotten worse– going from 3-13, to 1-15, to being slated to go winless this season, and having been 4th in the AFC North for the last 10 seasons. The 49ers have done the same– going from 5-11, to 2-14, to once again being slated to go winless. The Browns have been mired in quarterback controversy for years, never having a quarterback for a full season, so the turmoil may be explained by them not having a true cornerstone. For the 49ers, though, it’s a case of “how the mighty have fallen”, as a plethora of retirements, controversies and the likes have dropped them from a run of 11+ win seasons (including a Super Bowl appearance) to the cellar of the league. There are countless other stories to cover (the faltering, defending NFC Champion Atlanta Falcons, or the resurgent Carolina Panthers), but the Browns would have a decent shot at a Super Bowl before I could actually list them all. There’s only one way to find out how they all unfold, though, and that’s to keep watching some good ol’ American football. Featured image courtesy of 12up.com.